PORT TOWNSEND — Nineteen percent of total employment in Jefferson County is in the maritime sector, according to a just-completed economic impact study of the marine trades in the county. Of 2,243 jobs related to maritime, 1,154 are jobs directly tied to the working waterfront with an average salary of $47,583, $10,000 higher than the average wage in the county, according to the study. This represents $12.6 million in tax revenue, it said; an estimated $6.8 million was received at the state level and $5.8 million was received at the county and local levels. An overflow crowd of more than 300 stakeholders, elected officials and members of the community gathered at the Northwest Maritime Center on Thursday night to hear John Martin of Martin Associates, LLC, based in Lancaster, Penn., present his study findings. The study was commissioned by the Port Townsend Marine Trades Association to understand the importance of the trades to the local economy. 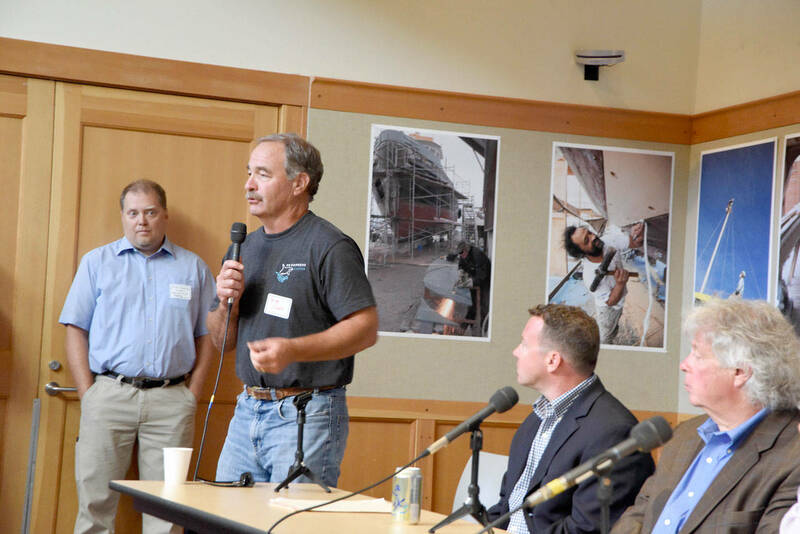 Martin, an economist who specializes in the maritime industry, said he conducted 166 interviews with members of the Port Townsend Marine Trades Association. His report is based on the 2016 census and economic data from the state and other sources. Martin said after the presentation that he was impressed with the commitment of those working to make the industry thrive. “The motive for doing the study was to show how important the trades are to Jefferson County,” he said. “There was no ulterior motive. If the marine trades ever want to go as a group and get infrastructure grants from the government, this is the kind of information that the feds or the state will want. “Look at the enthusiasm of the people here,” he continued. “I’ve done thousands of port studies and you rarely get a group this motivated, especially in a town the size of Port Townsend. It’s very impressive. Martin is familiar with this area of the county. His firm has done projects for the Ports of Seattle, Everett, Bellingham, Vancouver, Grays Harbor, Gig Harbor and Olympia. Jake Beattie, executive director of the Northwest Maritime Center who served as the evening’s master of ceremonies, thanked the 39 businesses and organizations who helped finance the report. Joshua Berger, current maritime sector lead for Gov. Jay Inslee’s Maritime Blue Initiative, lived in Port Townsend and was part of the maritime trades as the captain of the Adventuress and a buyer of marine trades services. He remarked that in a small maritime community, everything is connected. “City, port and marine trades and economic development work together to create a strategy to support a thriving maritime industry and leverage state initiatives that are going on. To survive and grow, this is necessary. If there’s a town ever that has the ethos to make that happen, it’s right here. Chris Sanok, chairman of the Port Townsend Marine Trades Association, said he looks forward to a dialogue with port commissioners to discuss the findings. After Martin’s presentation, audience questions were taken for panel members Martin, Berger, Sanok and Mike Sarbaugh, research analyst for Martin Associates. Among those commenting was Jeff Randal, Jefferson County Public Utility District commissioner, who suggested that the port consider creating a citizen’s advisory board to help them develop a strong direction and renewed partnerships. After the meeting, port Commissioner Steve Tucker said he was pleased to learn more about the impact of the marine trades. “We can use this study to leverage grant funding and become more competitive. This was a good coming together tonight to understand the challenges we are facing,” he said. The full report, “The Economic Impact of Jefferson County Marine Trades,” prepared by Martin Associates, can be found at www.ptmta.org.